Windhand sound like the kid brother to Sleep’s bleary-eyed, paranoid big brother. They make music that creeps and crawls slowly along. Maybe they’re stoned, or maybe they’re just cautious purveyors of doom. Their dirges of fuzz and thunderous metal would remain in the doldrums if it weren’t for singer Dorthia Cottrell. Her vocals add a touch of light to the proceedings. There’s nothing girly about how she sings. Vocally her voice remains not above the music but more of a faint howl amongst the doom and gloom. But the fact that she’s not growling and chanting, but actually singing, brings Windhand’s sound up from the depths of Hell to more like the backwoods of Virginia(where they’re from, btw.) It’s swampy, moss-covered doom; not fire and brimstone doom. For their newest album, the Virginia five-piece enlisted veteran album producer Jack Endino to helm the board and the result is Grief’s Infernal Flower, a dark, foreboding, 70 plus minute doom metal opus. This album is a stoned basement dweller’s delight. Light some incense, grab a six-pack, and head downstairs to your favorite stained couch. “Two Urns” opens the album with some crackling, oversaturated guitar tones that would make Matt Pike proud. Rhythm that slinks from the speakers like a black ooze and covers you for 8 minutes. You get carried off to some dark, moon-lit world that feels neither warm or familiar. Cue guitar solo. “Forest Clouds” remains in first gear as the song coasts down some dimly lit street in some faceless town. 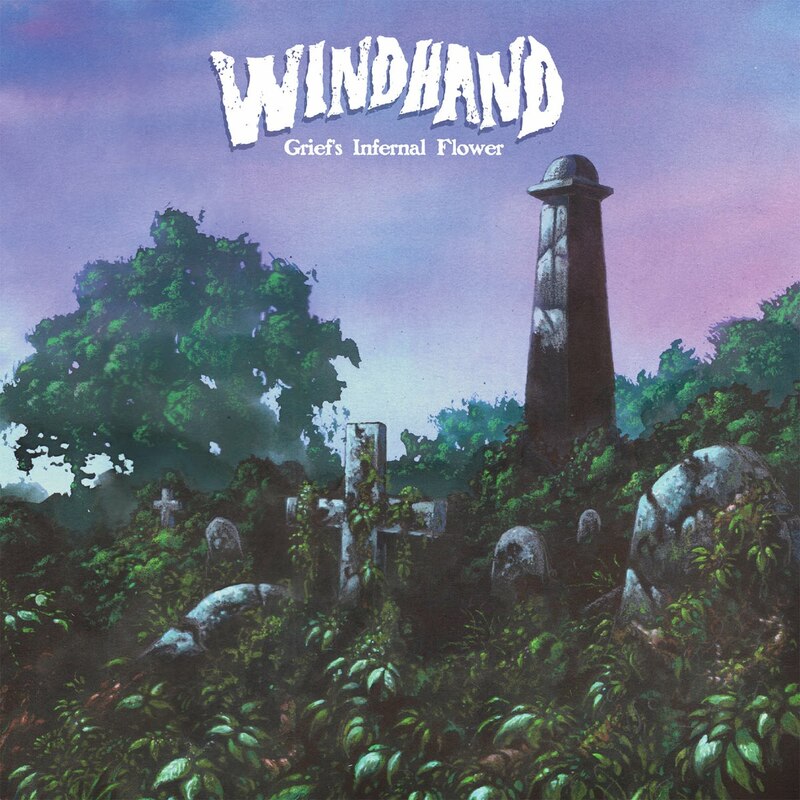 Windhand seem to have a handle on the stoner/doom vibe, and this song flows like lava from a crater. Dorthia Cottrell is the secret weapon here. If it were another doom metal guy growling here the music wouldn’t have the same vitality it has now. “Sparrow” and album closer “Aition” are ominous, acoustic strummers that work nicely against the backdrop of the impenetrable wall of fuzz and distortion. But those quiet moments are few and far between on here. “Tanngrisnir” is an overwhelming push of heavy, while “Hyperion” sneaks in like some long lost Black Sabbath track. “Hesperus” is over 14 minutes of crushing guitar and slow burn tempo. If Low and Electric Wizard would collaborate, I imagine it sounding like this epic behemoth of a track. “Kingfisher” follows “Hesperus” and matches that track with epic girth, but opens up more desolately. You get the vibe of slowly dying in some southern swamp, staring up at a starless sky as you slowly sink into the muck that will consume you. There’s no letting up, from start to finish. At times you can get lost as to where you are on this album. I wouldn’t say this record suffers from the same-y syndrome, but after a while the ears can get dulled by the Big Muff wall of noise. There’s enough stellar moments on this album that make up for the limited color palate. Grief’s Infernal Flower is a great and epic chunk of stoner/doom metal. Put on some headphones and let the over 28 minute block of “Hesperus” and “Kingfisher” melt your psyche. That 6-pack isn’t required, but recommended. I came close to buying this just for the cover art on my recent Relapse Records bender, but I pulled up just short. I really like that cover though. Puts me in mind of Masters of Reality’s Blue Garden album cover. Yes, you’re right another old fave of mine; although not one I have any more. It used to go for a fortune on vinyl. One I’d love to own on vinyl. Still have the CD.